Developed for the rigors of the marine environment. Features premium-grade synthetic and mineral-based stocks with specially designed marine grade additives not required in automotive oils. Outstanding lubricity for internal engine components to reduce wear, scuffing and scoring. Excellent running quality and long-term reliability. 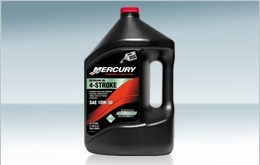 Rigorously tested to guarantee warranty protection for Mercury and Mariner 4- Stroke outboards.